James Anderson was in Duluth, MN for Myokinematic Restoration. Had a great weekend in Duluth with Karen Swanson, PhD, PT, ATC at the beautiful College of St. Scholastica, who teamed up with Shannon Sharpe from St. Luke’s Hospital to host Myokinematic Restoration. So great to get to spend time with Karen, a friend and longtime associate of mine, whose PRI roots extend back to the early days of the Institute when we were both faculty members teaching Protonics courses starting in 1999. Her friendship, hospitality and kindness are a part of what has always made PRI Nation so great. I’m excited to brainstorm further research ideas with you Karen and to work together on some of the collaborative research possibilities we discussed. And thank you to Megan Bollinger, PT, PRC and Jesse Ham, PT, PRC for working with me as my lab assistants for this course. You both did a great job helping the course attendees appreciate the finer points of patient evaluation and treatment and helping to give them keys for success. Jesse, I also appreciate the opportunity to mentor you as you finalize the process of becoming an instructor for this course. You did a great job and will be a great Myokinematic Restoration instructor. We discussed the three-dimensional control of the acetabulum over the femur and the reasons why it can be more common to want to jump off the left leg (a late stance performance activity) when the common pattern is so dominantly driven towards the right. We also discussed why it can be so difficult to jump off the right leg because we get so lateralized to the right and essentially get “buried” in the right hip joint (an early stance performance activity). This highlighted the need to have people reclaim right late stance performance with Right AFER Glute Max and left early stance performance with Left AFIR Ischiochondylar Adductor Magnus following left AFEXT Hamstring training. We also outlined the use of ligamentous muscle to stabilize pathologically lax hip joints. We talked about what is required of the AF joint and the FA joint during different phases of the gait cycle on both sides of the body and related these requirements to what we test for with the Hruska Adduction Lift Test and the Hruska Abduction Lift Test. We also came to appreciate the muscles that oppose the left AIC pattern and the specific planes that are the most necessary for each one of the hip rotator muscles on both the right and left sides of the body. Mike taught Cervical Revolution for the first time! Bethesda, MD. Course in review. 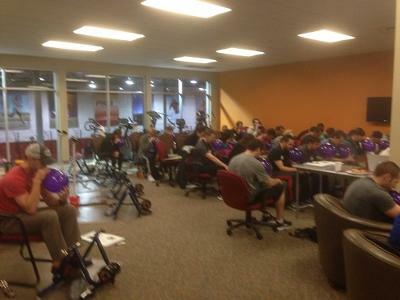 Last weekend I taught Cervical Revolution for the first time. I was fortunate to have taught it at Point Performance in Bethesda, Maryland with Haim Hechtman DPT as the host. Haim is a good man with a good heart who rolled out the red carpet with his staff of PT’s. We had 4 dentists in the room who all said that the class was informative and enlightening and that the material was certain to affect their method of practice. Multiple PRC’s in the class also said that they gleaned some good information and actually looked forward to application of new techniques in their individual practices. I received feedback from many that they needed more information on delivery of techniques and I will assure you all that as I continue to refine my delivery of the course that ensuing classes will benefit from your feedback. I cannot thank you all enough for making me feel welcome and I look forward to future Cervical Revolution classes! Cirque Du Soleil hosted James Anderson. 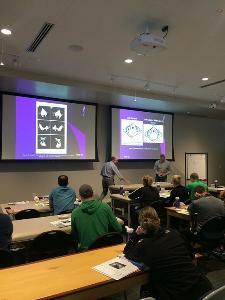 Impingement and Instability Course in Review. Stephanie Huntsman and the good folks at The Cirque Du Soleil outdid themselves this time around hosting a great weekend of Impingement and Instability. It's always great to return to my hometown Las Vegas, and this weekend did not disappoint. In large part due to Stephanie's kind hospitality in arranging great seats for Karen and I to see two great Cirque shows. We absolutely loved The Beatle’s musical and visual experience "Love" at the Mirage and could not believe how amazing "KA" was at the MGM Grand. Incredible stuff! Performers and acrobats as talented and athletic as anything I’ve seen. And this course had quite the international flare as well. Luke Worthington, CSCS traveled all the way from London, England. Kan Sugiyama, ATC, CSCS traveled all the way from Tokyo, Japan. Takuto Kondo, ATC, CSCS, DNSET, PRT traveled all the way from rural Japan. And Jacqueline Walt, PT traveled all the way from Toronto, Ontario Canada. Its awesome to see such a developing interest in the science of PRI in so many places, both national and international. Lucy and David, thanks for joining us again from Gym Laird Strength and Conditioning in Lexington. Donna, thanks for coming down from the Great Falls Clinic to represent the great state of Montana. Clete Sigwart, ATC, thanks for your strong interest and for representing the Cincinnati Reds so well. And Mike Zhao, thanks for bringing all those great biomechanical questions all the way from New York City. You guys were all great. Impingement and Instability allows us to discuss the various areas of the body that can become unstable and fall into both predictable and unpredictable patterns of compensation. We had a great discussion and also demonstration of calcaneal posture and patterns of neurological reference through the foot. This foundational discussion provided a basis for the femoral instability discussion, the ilial instability discussion and even the scapular instability discussion. Thank you to my old friend Nick Valencia, PT from Foothills Sports Medicine and Physical Therapy in Gilbert Arizona (aka Nick Cage) for helping me get both sides of the rib cage internally rotating like it should. This rib activity allows a well positioned and mobile Zone of Apposition and really helps to stabilize the central pillar of core strength for all types of movement. Its so great to see all the good that results when ribs rotate like they should. Nick Cage helped us all learn what rib cage mobility can do to direct proper movement sequence, proper patterns of airflow and the use of neurological reference centers in all parts of the body. Awesome stuff. Pelvis Restoration, Seattle, WA. Course in Review. 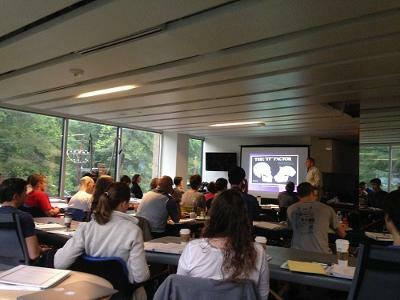 We had 42 attendees at Pelvis Restoration this past weekend in Redmond/Bellevue WA (just outside of Seattle.) 16 of the course attendees were new to PRI! Not only did the course participants gain understanding of frontal plane of the pelvis for stance and swing phase of gait, the ability to utilize PRI tests to assist with which quadrant needed inhibition to assist with facilitation of the frontal was emphasized. Lots of “light bulb moments” and further enhancement of PRI was capitalized. This group was awesome. Lots of great questions and comments from some intellectual clinicians. Much thanks to Carl from Pro Sports Club for hosting us this past weekend and also to my lab assistants Minh Nguyen - OTD, OTR/L, PRC and Cathy deSmet, PT, PRC. Teaching Cervical Revolution this last year was truly amazing and one of the most inspirational and rewarding two days I’ve ever had, simply because of course attendee history and location. It was my first PRI course in a new building that reflects both traditional and non-traditional PRI approaches and applications. It was given to an audience that had a course attendee who has been a class participant since 2001 and a faculty member who has been a class participant since 1998 and a faculty member since 2008. Joan Hanson and Mike Cantrell, truly the honor was all mine. I love teaching this course because it represents our history, our scientific foundation and our future direction. The influence of the week on our postural, physiologic and psychologic behavior is unprecedented because of the magnitude that the foramen magnum has on pattern processing. New PRI Hub Building Tour! We are so excited about our new PRI Hub! Below is a video tour if you weren't able to make it to Interdisciplinary Integration or Cervical Revolution. We can't wait to host you at a course soon! Our next course at the Institute is Myokinematic Restoration. I had a great weekend in Providence, RI. So happy to experience another spring weekend in the Northeast! The trees were in full bloom as was the interest in PRI. We once again had a diverse group of clinicians from PT’s, ATC’s, and Strength and conditioning specialists, massage therapists and Students! The course attendees were mostly new to the science of PRI 29 out of 46 were taking their first PRI course. And the #PRINation grows again! 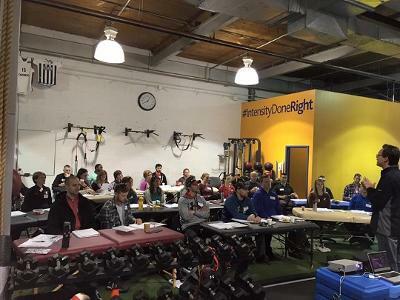 It is so great to have so many new clinicians and wellness professionals interested in learning PRI. I don’t think I have taught a course this year that hasn’t had at least one student in attendance. Thank-you to Karen Taylor-Soiles and Michael Mullin for helping me during lab! These two are so passionate about helping others and I was blessed to have them as my assistants. A special thanks to Dan and Tom from University Orthopedics for hosting for PRI this weekend. I had a great weekend in Quebec with the professionals at CoreXcellence in beautiful Montreal. I was given first class treatment by our host, Don White, and the rest of the CoreXcellence team, Vito DiCosola, Oz Beneli, Rich Thaw, Chris Latham, Iordan Krouchev, Leah Mamane, Jeff Saibil and Dr. Ora Loeub, B.Sc., D.O., DSc.O.,CAT(c). You guys were fantastic and are a very forward thinking group that are doing wonderful things with the science of PRI. Thank you for helping me clarify the differences between a Canadian Certified Athletic Therapist and a US Certified Athletic Trainer. Thanks again for all of your support and for being such a great host site for PRI training in Eastern Canada. Impingement and Instability allows us to discuss the study of sensation and the human sense organs. 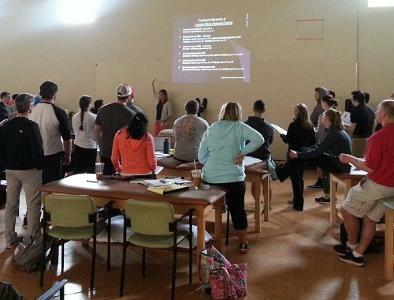 We outline stabilization centers or neurological reference centers as key elements to organize and control movement. We outlined 2 or 3 key restrictions or limitations to normal right vs left patterns of human movement that PRI evaluates very closely: 1) unexhaled air maintained in one side of the thorax, 2) hypertonic polyarticular muscle chains on one side of the body and 3) poor neurological perception of our body’s right side vs left side position via compensatory reference centers. If you can’t remove the unexhaled air, inhibit the overactive muscle chain and sense your body’s position in space relative to the ground on both sides then your movement patterns are likely to be compensatory. We had a great discussion and also demonstration of calcaneal posture and patterns of neurological reference through the foot. This foundational discussion provided a basis for the femoral instability discussion, the ilial instability discussion and even the scapular instability discussion. Thank you to our willing volunteers for showing us your non-summertime legs to demonstrate femoral vs tibial rotational alignment. And thank you to the entire class for being willing to walk through the right train station to left train station feed forward gait exercise. Also appreciate the volunteers who allowed us to demonstrate the value of full rib internal rotation on both sides of the thorax and the role that rib rotation plays in muscle inhibition. You were great sports and your participation helped us all learn together the value of proper movement sequence, patterns of airflow and the use of neurological reference centers. 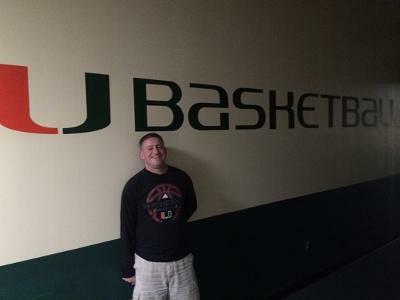 Thank you Jason Robey MS, LAT, ATC, PRT and the University of Miami for hosting Pelvis Restoration last weekend at the Bank United Center. A good mix of ATC, PT, CMT, DC, and strength coach populations were present for our discussion of the power generated when we properly position and operate a pelvis. There were great questions and lively discussions about the role an inlet and outlet of the pelvis has with regard to integrating lower extremities with an appropriately positioned thorax. 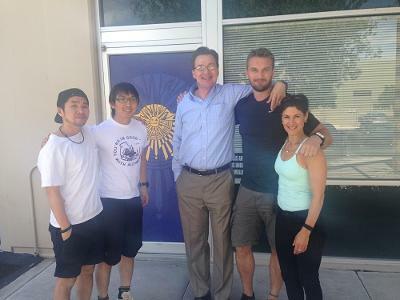 We discussed how to understand clinically relevant interventions for athletes of all ages and capacities as well as how a thoracic and pelvic diaphragm positioned with appropriate inhibitory techniques is paramount for purposeful movement in and out of the arenas of competitive sport. Thanks again for being an engaging group, and thanks again Jason for your help making this past weekend a Pelvis Restoration learning success! Go Cats Go!! What fun this course was for me! But I guess they all are in one way or another huh? But… 25 years ago this May I graduated from the University of Vermont as a bright eyed and bushy tailed PT ready to take on the world. It is so nice to still be so bright eyed about my profession. Vermont, as most of you know is special to me, not only because I graduated from UVM, BUT both Chris (my husband) and I grew up in VT so going here to teach is also going home. I enjoyed a beautiful spring weekend. The trees were budding and so was the interest in learning about PRI. I had a great time with this group of PT’s, ATC’s, Strength Coaches, Massage Therapists, Wellness providers and one very special DC that I only wished I had more time to talk to about PRI. I had the privilege of working with two friends and fellow PRC’s Holly Spence and Cory Healy as my lab assistants. These two are Pros and made my time that much more enjoyable. What was even cooler was 3 soon to be DPT’s ready to graduate from UVM in just a few weeks were in the front row! See “The Future of PT” and me pictured below. Good luck to Johnny, Kathleen and Natalie from the Class of 2016! The UVM Athletic Medicine staff is also dear to my heart as my husband is a former consultant and teammate of the current staff. 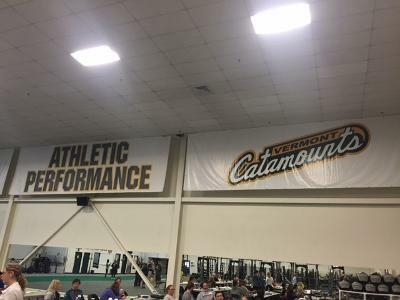 Many a nights were spent cheering on the Catamounts. I was so thrilled to meet their new staff and see some familiar faces. Looking forward to helping the UVM staff take their student athletes to new heights with PRI in the mix.